I went on a brief weekend road trip to my hometown. My cousin and his wife knew I had never participated in the sites of Niagara Falls, even though I lived in Buffalo the first 22 years of my life. One of those things where you take your surrounding for granted until you are no longer living there. 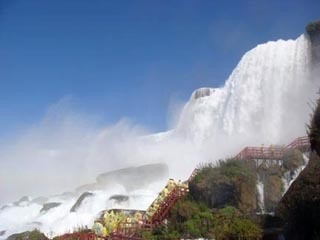 They took me to the Cave of the Winds and Maid of the Mist in Niagara Falls on the American side. The Cave of the Winds was a blast! Mother Nature provided us with a gorgeous day. We paid for our tickets — the fee included a yellow disposable slicker and a “fashionable” pair of foam sandals. We then joined a looooong line and patiently waited to enter. You take a quick elevator ride down inside the cave walls. You then take a brief walk thru the cave to the outside. You definitely want to be wearing your slicker at this point because you are sprayed with water shooting off the rocks. The views and colors of the Falls are SPECTACULAR as you climb up and down the red wood stairs, getting as close to the sides as you dare!!! I had a really great time. Side Note: The sandals are provided to tourists so they can keep their own shoes dry and the sure-grip soles of the sandals prevent slippage on the wet scenic decks. Afterwards you can place your sandals in a large bin. The recycled sandals are given out to individuals who are in need of footwear locally, nationally and internationally. The sandals are distributed by members of the Project Angel Shoes Distributor Partnership Program. In May 2008, 65,000 pairs of sandals were donated to individuals in poverty-stricken Haiti.